The starting point is the masterpiece of Filippo Brunelleschi: the Hospital of the Innocents, the largest orphanage of the city. Started in 1419 it represented a turning point among charity institutions for the rational use of space and for its timeless harmony, thus shaping the model of the modern city. Inside this perfectly preserved Renaissance convent you can find the richest display of Fra Angelico’s works. As a Dominican Fra Angelico lived and worked within these walls and some of his most important altarpieces for various churches have been reunited here. The different rooms and spaces introduce you to the daily life of friars: hospice, refectory, and chapter house are the result of the sober and effective intervention of Michelozzo and of Medici patronage. 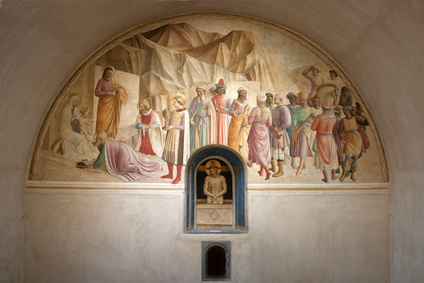 The frescoes of Fra Angelico decorate the common rooms as well as the cells and invest the impact of Renaissance painting with a deep spirituality. The museum also includes memories and relics once belonging to Girolamo Savonarola, one of the most controversial figures of Florentine history, capable of combining political passion and extreme faith leading to the darkest consequences. The Last Supper in Sant’Apollonia. The refectories (dining halls of convents) of Florence have been frequently decorated with scenes of the Passion of Christ and depictions of the Last Supper in particular. The refectory of Sant’Apollonia is an early Renaissance masterpiece painted by Andrea del Castagno around 1450: the majestic apostles and the geometrically enhanced scenery witness the artist’s commitment on perspective, in order to translate the traditional subjects matters in a new figurative language. Operates morning only, from Tuesday to Saturday.